Despite a great start to the first One Day International (ODI) between India and Australia, the home team won. Australia won by 34 runs with 288/5 compared to India’s 254/9 in 50 overs. The team leads the three-match series by 1 – 0. Australia won the toss, and chose to bat first at the Sydney Cricket Grounds. Rohit Sharma opened and reached 133 runs. This was Sharma’s 10th tournament or series in a row in which he made at least one century. Despite his personal victory, there was simply not enough support from the rest of the team. Shikhar Dhawan, and Ambati Rayudu, both out on lbws did not add any runs to the total. Virat Kohli, the team captain, only managed to add three runs. MS Dhoni make a half century with 51 runs. Dinesh Karthik added only 12 runs, and Ravindra Jadeja only managed eight. Things looked up slightly with Bhuvneshwar Kumar with his 29 runs. Kuldeep Yadav managed only three runs, and Mohammed Shami added only one run to the total. While Australia had no centuries, the home team produced three 50s and one player at 47 not out. The Australian team played without many of their star players, and yet still managed to take the first ODI to a win. India was essentially one good run partnership away from a win. India and Australia play the next ODI match at the Adelaide Oval on 15th January 2019. 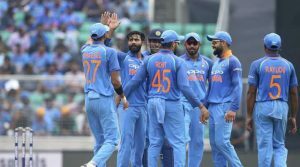 India will need to fight hard to equalize the series, in order to leave the option open for a win. The visitors will fight the odds for a win at the Adelaide Oval. Australia won the last nine out of 10 ODIs between India and Australia at home. The home team also won the last five ODIs at the Adelaide Oval. India’s history at Adelaide shows only a single win out of the last five played there.